BRIGHTON, Mich. - You may have heard a few people in the automotive industry– especially the truck world– talk about the all-new 2017 F-150 Ford Raptor. What is causing so much excitement is the fact that the new truck just recently completed over 1,000 miles of testing in the southwestern part of the United States. The 2017 Ford F-150 Raptor was tested in the harshest conditions attainable and this is Ford Motor Company's roughest, smartest, most capable off-road truck ever! The '17 F-150 Raptor was tested over 1,028 miles of complete desert trail designed to parallel the Baja race course in the Mexican desert, and the 66-mile route featured a wide range of surfaces including fast sandy washes, deep-rutted silt beds, steep climbs in deep sand, and slow meticulous crawls through tight trenches. In some places, the Raptor topped out at speeds just over 100 mph while slowing all the way down to 10mph in some places. The average speed over the course was 50mph and the 2017 F-150 Raptor completed the lap at a rate of 25% faster than the current model. Impressive right? At the end of each race lap, the Raptor completed a tabletop jump which consisted of a steep ramp up to a two-foot plateau, then a step-off back to level ground. As is the case with ALL Built Ford Tough Trucks, the vehicles were put through EXTREME tests that a normal truck purchased from a dealer lot would never go through in it's practical lifetime usage. 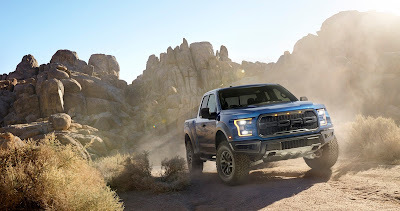 Engineers and experts at Ford Motor Company pushed the Raptor harder in a test that lasted a few days than it will be pushed over its lifetime. The 2017 Ford F-150 Raptor was tested in the harshest conditions attainable, therefore, it is the PERFECT truck for your off-roading needs! The all-new 2015 F-150 Raptor hasn't made its way to dealers yet, but as soon as they arrive we'll let you know about it! Until then, feel free to stop by your Howell Area Ford Dealership and check out any of our current 2015 F-150 models and take them out for a test drive.